The Wall Street Journal, the 124-year-old broadsheet, wants advertisers to know that it "gets" video as well as digital in general. While the Journal's relatively affluent viewer demographics are envied in the publishing community, it's still one of many traditional news outlets that face challenges in concerns to perceptions in an increasingly BuzzFeedy content world. 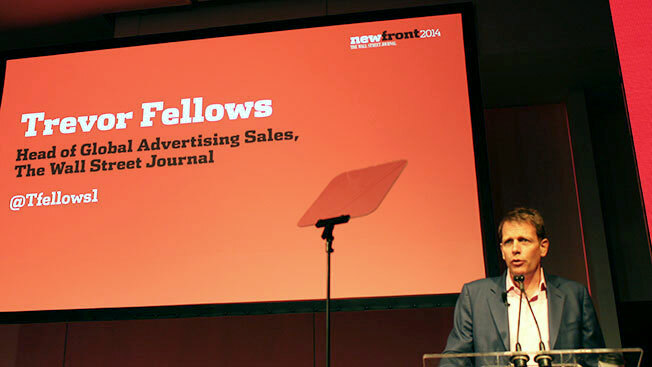 "We really want to sit down and ideate with advertisers," Trevor Fellows, head of global media sales at the Dow Jones-owned news brand, told Adweek after his team's NewFronts presentation this morning. "They may not think of us as a digital video innovator, but our message to them is, 'Let's talk.' It could be branded content, it could be sponsored content, it could be bespoke, or it could be a deeper partnership. There are really a wide range of things we want to do." The Journal highlighted a slate of original video programming at its midtown New York #wsjrightnow event, which drew around 350 players wearing the stock duds of the ad industry—blue blazers, business dresses and pantsuits. In terms of formats, the numerous programs will include everything from data-driven short explainer videos to long-form, documentary-styled series about startups and where tech and lifestyle intersect to a video magazine called Signal. This isn't your father's stocks-and-acquisitions Journal, Fellows asserted. "I think some people, who don't know us as well as our readers, still think we're just about business and finance," he said. "What we've brought together [content-wise] shows how the world is being changed by ingenuity, tragedy, innovation, determination—as well as finance and business." While speaking at the event, Gerard Baker, the WSJ's editor in chief, said his company's digital properties generated 18,000 videos and 480 million video streams in 2013. It was the publication's second presence at the Digital Content NewFronts, an eight-day confab in just its third year that's mostly dedicated to video programming and advertising. The WSJ's spiel came on the heels of introducing a native ads studio in March. Watch Fellows' 15-second pitch to marketers in the Instagram video below.